The ALC has a competition going on that has been very fun watching evolve. On each side of the school, there is a Christmas tree set up for the different classes located on that side to decorate as a team. The students were supposed to come up with decorations that either represented their class, or that was made as a result of something they could use in their class. It has been very fun to see the creativeness that the students have had. 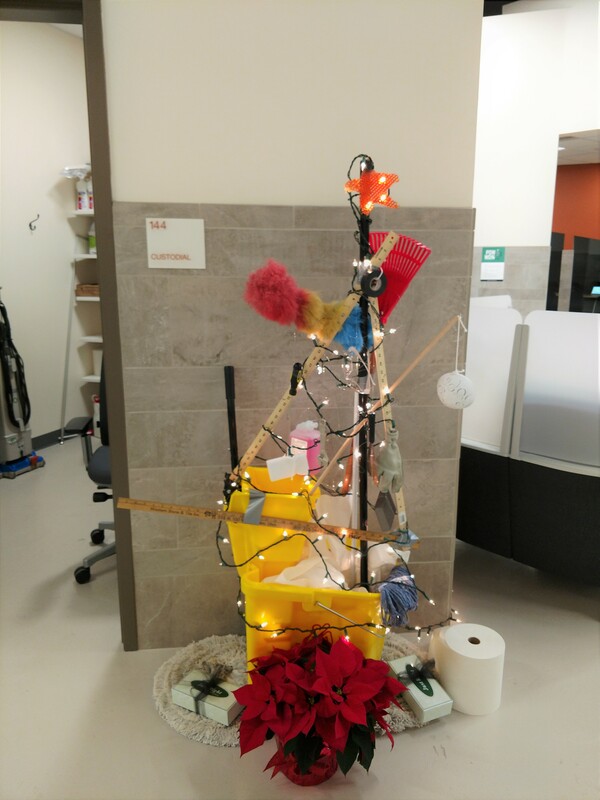 The Custodians and sweepers even got involved and ended up with a very clever, and well thought out tree. Spearheaded by Jason Hanks, they came up with a real winner of what we've entitled the "Bucket tree". It has many clever decorations, especially the star they fashioned out of janitorial supplies. It will be fun to see the ending products next week with both sides of the school working on ingenious ways to "Top" their tree. One may involve a drone, and one may involve a robot. Stay tuned to see who comes out on top!